Foreign direct investment has become the major economic driver of globalisation, accounting for over half of all cross-border investments. for example, approximately $1 trillion in greenfield investment was announced by companies in 2007, creating about 3 million jobs in their overseas subsidiaries. Companies are rapidly globalising through FDI to serve new markets and customers, map out their value chains in the most efficient locations globally, and to access technological and natural resources. A government of another country may also decide to invest in other countries through the direct provision of grants to developing countries. Foreign direct investment is often used by multinational companies as a means of extending their manufacturing to countries abroad. Foreign direct investment by multinational firms is said to have grown tremendously over the last two decades even above trade flows. (Markusen and Venables, 1999). International economic activity increasingly involves foreign production and intra-firm trade by multinational firms and it is now estimated that approximately 30% of world trade is intra-firm. (Markusen and Venables, 1999). Despite the growth in FDI, Markusen and Venables (1999) suggest that we have a poor understanding of the ways in which direct investment is just a simple substitute for trade, as well as the ways in which it is something quite different. Countries often offer incentives to foreign investors in a bid to lure them to invest in domestic firms. These incentives come in the form of trade policy concessions, financial assistance and tax breaks. (Girma, 2001). For example, Girma (2001) notes that the British government provided the equivalent of $30,000 per employee to attract Samsung to North East England and $50,000 per employee to attract Siemens to Newcastle. (UNCTAD, 1996). This incentive packages are justified on the grounds that productivity gains would be accrue to domestic producers from knowledge externalities generated by foreign affiliates. (Smarzynska, 2002). Furthermore, Girma (2001) suggests that these incentive schemes have been justified on the grounds that the facilitate the creation of jobs, as well as regional development. It is often believed that there is a productivity gap between foreign owned firms and domestic firms and the attraction of foreign direct investment can help bridge this gap due to the potential for spillovers. Girma and Wakelin (2000) suggests that spillovers would have regional dimension for a number of reasons. Spillovers can result from the direct contacts with local suppliers and distributors. This may arise from upward and downward linkages which may be local in nature thus minimising transport costs and facilitating communication between the supplier/distributor and the Multinational firm. (Girma and Wakelin, 2000). In addition, multinationals provide training to employees which increases the turnover of labour thus creating another avenue for spillovers. (Haacker, 1999) cited by Girma and Wakelin (2000). (Girma, 2001). However, Smarzynska (2002) suggests that there is little conclusive evidence indicating that domestic firms benefit from foreign presence in their sector. It has also been suggested that multinational firms have an incentive to prevent information leakage that would improve the performance of their local competitors in the same industry but at the same time may want to transfer knowledge to local suppliers in other suppliers. Smarzynska (2002). As a result, spillover effects from foreign direct investment are more likely than not to take place through backward linkages, that is, through contacts between domestic suppliers of intermediate inputs and their multinational clients. Smarzynska (2002). One would reasonably expect foreign direct investment to have an impact on the economic growth of a country. Foreign direct investment is said to provide a number of benefits to the receiving country through technological transfers, knowledge transfers etc. for example, for example, Borensztein et al. (1998) employ a model of technology diffusion to show that the rate of economic growth of a backward country depends on the extent of adoption and implementation of new technologies that are already in use in leading countries. Carves (1974) had earlier suggested that foreign direct investment influenced host country conditions through two main channels. Firstly, foreign direct investment should result in technological transfers to host country firms. This should be so because multinational companies provide subsidiaries with an efficiency advantage which should indirectly generate spillover effects to other domestic firms irrespective of whether they are subsidiaries of the multinational company or not. Secondly, multinational presence could also have negative effects on domestic firms as this would result into an increased level of competition in the host country. As far back as the 1970s, many host country governments and some economists viewed multinational investment as detrimental to host economies’ welfare and development, creating monopoly situations that exported those economies and stifled local competition. (Markusen and Venebles, 1999). The view in the 1990s was however considerably different and more optimistic, suggesting that multinationals have important complementaries with local industry and may stimulate development in host economies. (Markusen and Venables, 1999). In the absence of any microeconomic imperfections, a small foreign direct investment (FDI) project will have no effect on host economy welfare, so if a case is to be made for gains and losses, it must rest on the possibility that FDI creates or interacts with distortions in the host economy. (Markusen and Venables, 1999). Jordan remains a major region of inward foreign direct investment. Studying the impact of foreign direct investment on Jordan’s economic growth can be justified for a number of reasons. FDI theory suggests that multinational firms have firm specific assets which imply that the may also have higher productivity than domestic firms as a result of the superior technological knowledge, access to international networks and management structure. (Girma, 2001). A company with high foreign direct investment is therefore expected to be capable of benefiting from a substantial increase in net exports which is a major determinant of economic growth. According to Girma (2001) the fact that multinational companies have higher levels of productivity growth indicates that the host country should enjoy two main benefits: (1) the host country should benefit from new production facilities or benefit from the rescue of failing firms in the case of acquisition, potentially raising output, employment and exports; (2) foreign firms should be unable to internalise their advantages fully which should enable domestic firms to benefit from spillovers. (Girma, 2001). The combined effects of these benefits should therefore result in high levels of economic growth. It is therefore essential to test these propositions using data on Jordan. Foreign direct investment has been carried out in many other countries mostly in the Western countries such as the United Kingdom, United States, Germany, China, etc. The literature seems to be lacking in terms of Jordan. With increasing growth in multinational activity and increase concern as to whether FDI contributes to the general welfare of an economy, it is the interest of this paper to understand whether FDI contributes to the economic growth of a country, making reference to Jordan as a case study. Most of the studies on foreign direct investment have focused on the spillover effects of FDI activity to domestic companies. In addition, most of the studies have been carried out using microeconomic analysis. This paper considers the problem from a macroeconomic perspective by studying the direct relationship between FDI activity and economic growth on Jordan. The objective of this study is to model the effects of foreign direct investment on Jordan by using aggregate macroeconomic data over the period 1976 to 2006. To isolate the effects of other macroeconomic variables on economic growth and to improve the overall significance of the model, the neoclassical growth model will be employed. The study will serve as a yard stick for policy makers when designing macroeconomic policy in relation to incentives related to the attraction of foreign direct investment in Jordan, openness of the economy, designing monetary and fiscal policy in Jordan. The research will also serve as a guide for further research to students and researchers interested in studying the impact of foreign direct investment on the economic growth of Jordan. 1.5. Limitations of the Study. 2.1 Definition of Foreign Direct Investment. Foreign direct investment is defined as the process whereby a company in one country makes a physical investment to build a factory in another country. These include investments made to acquire lasting interest in enterprises operating outside the economy of the investing company. Foreign direct investment is often promoted by multinational companies when they decide to expand their manufacturing or businesses abroad. Foreign direct investment is also considered to be a diversification strategy pursued mostly by multinational companies which involves the purchased of assets, usually associated with manufacturing or distribution facilities, in another country. FDI is often regarded as the second stage of overseas involvement after agency or licensing agreements have been used to establish a market. Investors in such companies find it more appropriate to reinvest the earnings generated from foreign activities due to the difficulties entailed in the repatriation of profits, as well as the differences in tax systems that may make it more efficient to retain earnings and reinvest overseas, than to bring them home. According to Lim (2008) citing Dunning (1996, p. 56) there are four types of motives behind the FDI activities of multinational firms. These include resource seeking, market seeking, efficiency seeking, and strategy asset capacity seeking. (Lim, 2008: p. 40). These are referred to by the UNCTAD as economic determinants. (Lim, 2008). A host country’s policy framework and business facilitation also plays an important role in determining MNCs’ FDI activities. These include the size of the domestic market, institutional and political environment of the host country, the number of distribution channels, the level of financial development, the taxation policy of the host country etc. According to James (2008) the level of financial development may affect the level of foreign direct investment. Accordingly, financial development acts as a mechanism in facilitating the adoption of new technologies in the domestic economy. (James, 2008). It has also been suggested that the building of distribution channels in the host country may also affect the level of foreign direct investment. (Stoian and Filipaios, 2008). This indicates that the more distribution channels a firm can build and the more easy it is to build these channels in the host country, the higher would be the likelihood that the multinational company will make an investment in the host country. Another important factor is the political environment of the host country. It has been suggested in the literature that there is a relationship between broad indices of socio-political instability and institutional quality, political freedom and democracy and FDI. (Kolstad and Vollanger, 2008). The political environment of the host country is therefore an important determinant of FDI. Conventional wisdom detects that high levels of political and social stability, high political freedom, high institutional quality, and high levels of democracy will facilitate the levels of FDI. On the contrary, a country that performs poorly on the latter indices of political and institutional factors runs the risk of attracting little or no FDI. The size of the domestic market also influences foreign direct investment. (James, 2008). The larger the size of the domestic market, the higher will be the level of FDI as multinational firms scramble to reap the benefits of economies of scale (economies of scale represent the advantages a firm enjoys because of the fact that it is operating on a large scale. Taxation policies both in the home and host countries may also affect the level of FDI. For example, Hartman (1981) suggests that since the repatriation of earnings to the home country investor and not earnings themselves form the source of the tax liability, the foreign source income should affect investment differently depending on the required transfers of funds within the firm. Consequently, in order to maximise after tax profits, a firm should finance its foreign investment out of foreign earnings to the greatest extent possible. This further indicates that the required return on investment abroad increases at the point at which foreign investment just exhausts foreign earnings. (Hartman, 1981). Foreign direct investment is also determined by corporate governance. For example, Lien et al. (2005) provide evidence that the presence of a large number of supervisors is associated with FDI outside China, which is consistent with resource strategy views on corporate boards. They also find that family control and share ownership of domestic firms are associated with FDI strategy. There is also an observation of a negative relationship between foreign share ownership in Taiwanese foreign firms and FDI decisions. (Lien et al., 2005). Wu and Radbone (2005) observe from Shangai data that different local factors determine the location of different patterns of FDI. For example, Wu and Radbone (2005) suggests that the development characteristic of urban districts is an important determinant of the location of service and manufacturing FDI. They provide evidence suggesting that service FDI tends to aggregate in the areas that already have a high density of service activities whereas manufacturing FDI prefers to locate in central government-designated areas where incentives and preferential treatment are present. (Wu and Radbone, 2005). A number of studies have been carried out on FDI in different countries across the globe. These include, the United Kingdom, the United States, Germany, France, Developing countries, emerging markets such as China, India and Brazil. 2.3.1 FDI in the UK. It has been suggested that the United Kingdom is the most successful national location for new foreign manufacturing investment entering the European Union. (Hill and Munday, 1994) cited by Driffield and Munday (1998). For example, the United Kingdom attracted net inward foreign direct investment of approximately £27.2billion between 1987 and 1993 and estimates show that foreign manufacturing firms in the UK employ more that 78,000 people, and account for more that one quarter of UK manufacturing net output sales. (Driffield and Munday, 1998). Major contributors to foreign direct investment in the UK include companies from the United States, Germany, France and Japan and the major vehicle for this inward foreign direct investment is the acquisition of domestic UK companies. (Child et al., 2000). Girma (2001) investigating the presence of productivity or wage gap between foreign and domestic firms in the UK, as well as whether the presence of foreign firms in a sector raises the productivity of domestic firms provide evidence that foreign firms achieve greater productivity that domestic firms and pay higher wages. There is no evidence of intra-industry spillovers. (Girma, 2001). The findings from this study are inconsistent with an earlier study by Girma and Wakelin (2000) which suggests that domestic firms gain from the presence of multinational firms in the same sector and region, but loose out if the firms are located in a different region but the same sector. In addition Girma and Wakelin (2000) suggest that spillover effects are also influenced by the characteristics of the region. For example, less developed regions are found to gain less from spillovers than other regions, sectors with high levels of competition gain more, and sectors with low technological gap between foreign and domestic firms benefit from higher spillovers. (Girma and Wakelin, 2000). Table 1 below shows the trend of direct investment into the UK between 1986-95. Source: Child et al. (2000). It can be observed that the USA remains the major contributor of FDI to the UK as observed from its increasing trend of FDI to the UK over the period 1986 to 1995. One can also observe that Japan has also been a major contributor but the FDI from Japan to the UK in the years to March 1993/95 witnessed a significant drop from £1,085.00million in the years to March 1990/93 to £109.1million. Germany has also been a major contributor with an increasing trend of FDI to the UK. France has been contributing the least among the four countries but the trend increased from £59.2million in the years to March 1992/93 to £1,188.2million in the years to March 1994/95. One can also observe that these four countries accounted for the highest proportion of FDI to the UK over the proportion ranging from approximately 73.0% ro 81%. Their share of FDI however witnessed a declining trend between the period 1986/7 and 1992/3. Their share of FDI to the UK again rose from 70.8% in 1992/3 to 80.9% in 1994/5. Driffield and Munday (1998) observed whether the extent to which foreign direct investment in selected UK manufacturers has an impact on the report profit of domestic firms. The evidence suggests that in addition to having an impact on domestic market share, entry by foreign firms also has an impact on the domestic cost conditions which leads to a high probability that the profits of the domestic firms may be reduced. 2.3.2 Foreign Direct Investment in the USA. 2.2.5 FDI in the Euro Area. 2.4 Foreign Direct Investment in Jordan. Jordan falls among the countries classified by the United Nations Conference on Trade and Development (UNCTAD) as “front-runners”. These include countries with high FDI potential and performance. (UNCTAD, 2008). Apart from Jordan, other countries classified as front-runners include Azerbaijan, Bahamas, Bahrain, Belgium, Botswana, Brunei Darussalam, Belgium, etc. (UNCTAD, 2008). For example, Jordan ranked number 7 in the 2004-2006 FDI performance index of the UNCTAD. This marked an improvement based on the 2003-2005 FDI performance index which ranked Jordan 19th. (UNCTAD, 2008). There has been a lot of studies ob how foreign direct investment affects the economic growth of a country. However, most of the studies have focused their attention of firm level data using a small sample of firms to test their hypothesis and later on generalise results to the country as a whole. In addition, most of these studies have focused on how foreign direct investment increase productivity growth with particular emphasis on the marginal physical products of factor inputs such as labour and capital. A number of studies have been carried out on foreign direct investment ranging from the determinants o foreign direct investment, impact of foreign direct investment on economic growth, foreign exchange rates and foreign direct investment, taxation and foreign direct investment, spill over effects of foreign direct investment, etc. In this section of the paper a number of these studies will be reviewed so as to see where there are still gaps in the literature. As concerns the determinants of FDI, Kolstad and Villianger (2008) employs firm level FDI data from 57 countries over the period 1989 to 2000, to examine the host country determinants of FDI flows in services as a whole, and in the major service industries. Their results suggest that institutional quality and democracy are more important for FDI in services than general investment risk or political stability. Specifically Kolstad and Villanger (2008) observe that democracy affects FDI to developing countries only, indicating that the absence of democracy is detrimental to investment below a certain treshhold. Consistent with the observation that many services are non-tradable, Kolstad and Villager observe that service FDI is market-seeking, and unaffected by trade openness. Stoain and Filipaios (2008) suggest that Greek firms invest primarily in similar countries with small market size, and open economies. High bureaucratic quality and rule of law are also found to be essential determinants of the FDI decisions of Greek firms while the existence of high corruption serves as a deterrent to FDI. (Stoain and Filipaios, 2008). James (2008) using data As concerns taxation, Hartman (1981) suggests that since the repatriation of earnings to the home country investor and not earnings themselves form the source of the tax liability, the foreign source income should affect investment differently depending on the required transfers of funds within the firm. Consequently, in order to maximise after tax profits, a firm should finance its foreign investment out of foreign earnings to the greatest extent possible. This further indicates that the required return on investment abroad increases at the point at which foreign investment just exhausts foreign earnings. Chapter 3. Research Methodology and Data. In this chapter, the methodology, as well as the data used to achieve the research aims and objectives would be discussed. Methodology is very important as it may affect the results of the study. It is therefore appropriate to discuss the methods properly since it will serve as a plan that would be referred to when completing each step in the latter part of the study. Data is very important especially the source from which it is obtained as some data sources tend to be unreliable while others are reliable. Relevant data must also be used in the study so as to ensure that the results are not biased. The research method appropriate for this study is a quantitative research approach. Unlike most of the studies on FDI that have often used firm level data, this firm is going to use aggregate macroeconomic data to achieve its objective. The study aims at analysing how economic growth in Jordan is affected by inward foreign direct investment into the country. The appropriate way to achieve this is to establish a relationship between economic growth and inward foreign direct investment and then determine whether this relationship positive or negative and whether the relationship is significant. The significance will be done by carrying out t-tests on the coefficients that will be obtained by running the regressions. To achieve this, a regression model would be used to model the relationship between FDI and economic growth. To isolate the effects of other variables, and to improve the significance of the model, it is necessary to include other variables in the model. According to the neoclassical growth model, economic growth depends on a number of factors. These include domestic investments, population growth, which can be proxied by the labour force, foreign direct investment, development of the banking system, openness of the economy and education proxied by the expenditure on education and technology proxied by capital formation. Based on the above discussion, we can write the following growth model for Jordan. If we assume that economic growth is determined solely by FDI we can write the following growth model. Where measures the annual growth in GDP per capita in percentage terms, represents a measure of the growth in per capita GDP not accounted for by fluctuations in the net inflow of FDI, is a parameter that measures the sensitivity of per capita GDP to changes in the net inflow of FDI, is the change in the net inflow of foreign direct investment to Jordan in year t, the subscripts t and j represent Jordan and time respectively, is a serially uncorrelated error term, which is assumed to have an expected value of zero. It measures the growth in per capita GDP that is neither accounted for by changes in FDI nor . where and remain as earlier defined, , , , , measure the sensitivity of movements in the per capita GDP growth to changes in banking sector development, government expenditure on goods and services, trade and net exports. The banking sector development is measured by using the domestic credit provided by the banking sector as a percentage of GDP. , , , and represent the change in FDI as a percentage of GDP for Jordan in year t, change in the banking sector development as a percentage of GDP for Jordan in year t, change in government expenditure as a percentage of GDP for Jordan in year t, change in trade as a percentage of GDP for Jordan in year t and change in net exports as a percentage of GDP for Jordan in year t, respectively. represents a serially uncorrelated random error term with zero expected value. Model 3 will also be estimated using ordinary least squares (OLS) regression and the significance of the coefficients will be tested using t-tests. The relationship between per capita GDP and economic FDI will also be explored. The data used in this study is obtained from the Economic and Social Development Service (ESDS) database, which reports world bank data on various economic growth indicators include GDP growth, per capita GDP growth, growth in exports, interest rates, consumer price index, inflation, expenditure on primary, secondary tertiary education, imports, exports, inward foreign direct investment, outward foreign direct investment, etc. Data on domestic credit provided by the banking sector as a percentage of GDP, exports of goods and services as a percentage of GDP, etc. The data is analysed using trend analysis and regression analysis. Trend analysis enables us to observe how the variables of interest have moved over the period under study. The period chosen for the study is 1976 to 2006. This spans over 30 years and enables us to observe how changes have taken place over the years. Trend analysis is however limited in that it cannot tell us which variables depend on which. We therefore turn to regression analysis, which enables us to study the relationship between variables and test for the significance of this relationship. We will therefore use regression analysis to determine how economic growth in Jordan is dependent on a number of growth determinants or indicators including banking sector development, foreign direct investment, population growth, government expenditure, gross capital formation, inflation, etc. 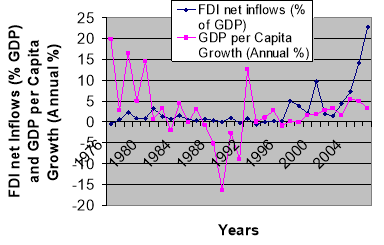 Figure 1: Jordan FDI net Inflows (% of GDP) and GDP per Capita Growth (Annual %) 1976-2006. "Effects of Foreign Direct Investment on Jordan." UKEssays.com. 11 2018. All Answers Ltd. 04 2019 <https://www.ukessays.com/essays/economics/effects-foreign-direct-investment-1777.php?vref=1>. "Effects of Foreign Direct Investment on Jordan." All Answers Ltd. ukessays.com, November 2018. Web. 23 April 2019. <https://www.ukessays.com/essays/economics/effects-foreign-direct-investment-1777.php?vref=1>. UKEssays. November 2018. Effects of Foreign Direct Investment on Jordan. [online]. Available from: https://www.ukessays.com/essays/economics/effects-foreign-direct-investment-1777.php?vref=1 [Accessed 23 April 2019]. UKEssays. Effects of Foreign Direct Investment on Jordan [Internet]. November 2018. [Accessed 23 April 2019]; Available from: https://www.ukessays.com/essays/economics/effects-foreign-direct-investment-1777.php?vref=1.